Endless Trim & Ribbon Options for Roman Shades! I thought I would post some photos of the different kinds of banding options we do for roman shades. As you can see, there are many different options! If you see something that isn’t shown, we are always up for a new design, as well! Sew Lovely usually provides 1 1/2” and 7/8” grosgrain ribbon in many different colors. We also have greek key ribbon tape and some other options. Many times the buyer provides the trim tape too! There are so many beautiful trims out there and they range in pricing, as well, from very affordable to very expensive designs. I have some websites listed here. 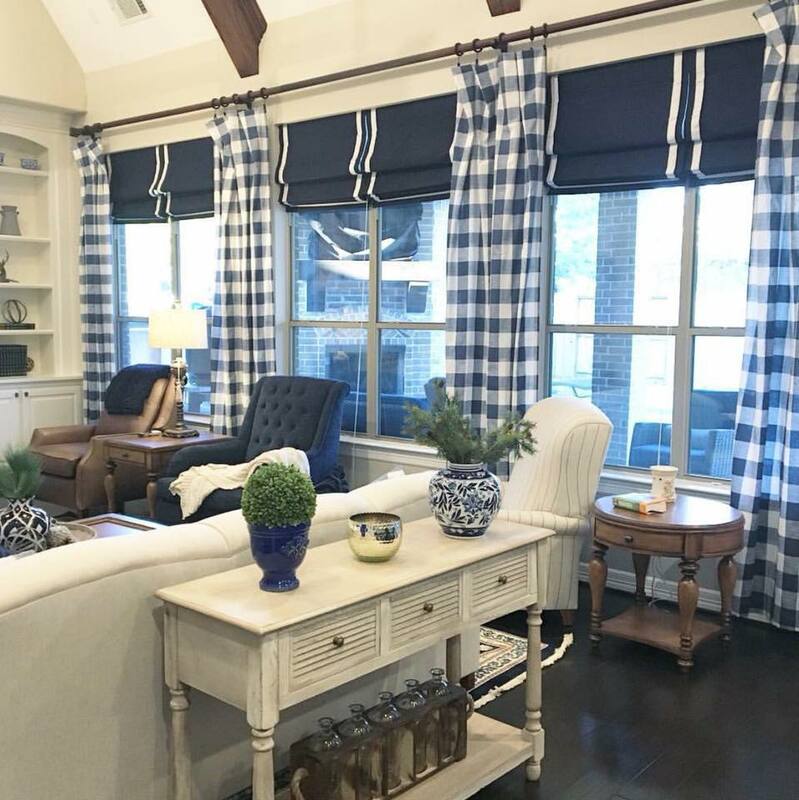 Below is an example of our most requested ribbon roman shade! Pottery Barn sells similar ones but only offers standard window sizes and a few color options. It’s Sew Lovely white canvas/twill using Sew Lovely grosgrain ribbon, inset on the sides and bottom of the roman shade. Many colors of ribbon available. Click here for the ribbon chart. 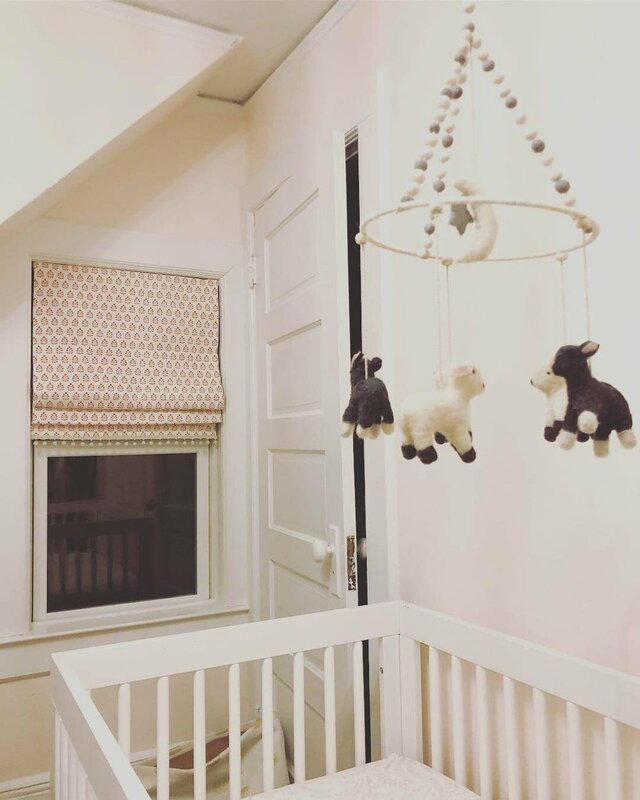 Below is another highly requested ribbon roman shade! It is our Sew Lovely white canvas/twill with inset double size grosgrain ribbon on the sides only. Many colors of ribbon available! Click here for color options for ribbon. Below is another great option for roman shades! It is our Sew Lovely white canvas/twill and double sized layered grosgrain trim inset on the sides and bottom. Many color combinations and sizes available! Click here for our ribbon colors. 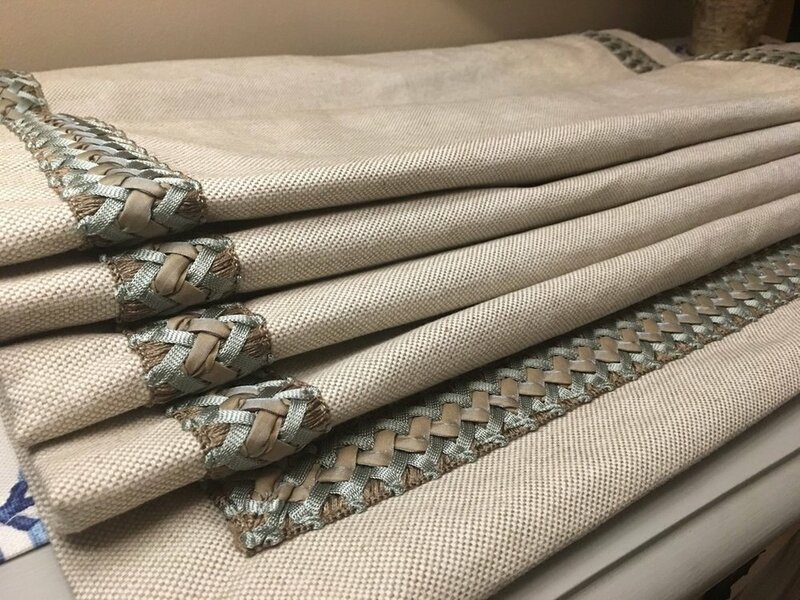 Below is an example of Sew Lovely white canvas roman shades using 2 different colors and 2 sizes of Sew Lovely grosgrain ribbon trim right along the edges on the sides only (not inset). Click here for ribbon options. Below is an example of 2 different sized grosgrain ribbon trim inset on the sides AND bottom! These shades use Sew Lovely white canvas/twill and Sew Lovely provided grosgrain ribbon. Click here for ribbon colors. 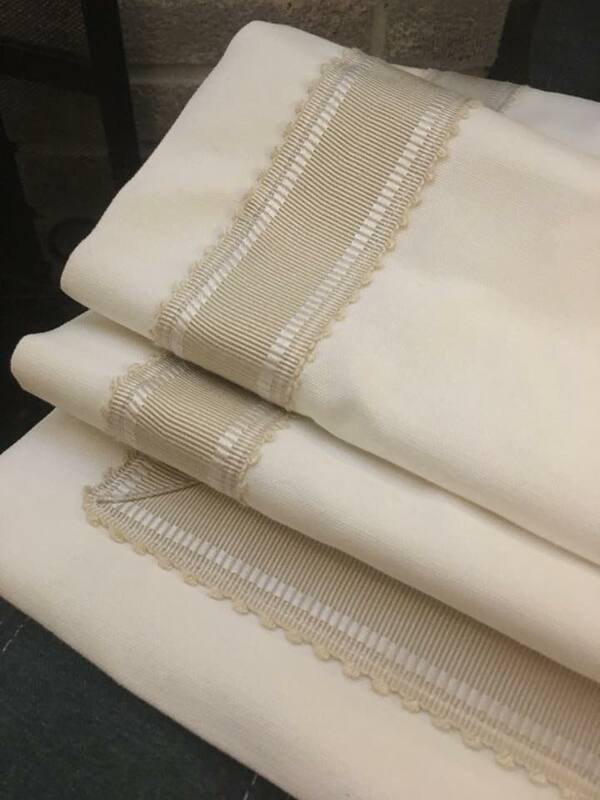 Below is an example of Sew Lovely roman shades using buyer’s provided ribbon inset on the sides and crossed on the bottom. Click here to see some websites to buy your own trim! Another lovely shade with ribbon trim! We have buyer’s provided fabric and buyer’s provided greek key ribbon trim! Click here for some websites to buy fabric and trim! Sew Lovely can also provide greek key trim. Below is an example of Sew Lovely provided navy canvas fabric and Sew Lovely provided grosgrain ribbon inset on the sides and bottom. We can provide many basic colors of canvas including, white, navy, black, grey and more! We can also provide many colors of ribbon trim! Click here to see our ribbon trim options. Below is an example of a roman shade we made and added piping and a ruffle on the bottom! We can add a ruffle in the same fabric as the shade or in a different fabric. Trims can also be added to the bottom of roman shades. Below shows a roman shade we made and added the buyer’s pom pom trim to the bottom of the shade! Pom poms can be found online on many websites and on Amazon! Here is an example of buyer’s provided fabric and buyer’s provided braided trim inset on the sides and bottom. Braided trim looks so nice on a roman shade! Sew Lovely Roman Shade with Greek Key Ribbon! Sew Lovely can usually provide 2” greek key ribbon trim tape. Contact us for details and options! Sew Lovely provided Charlotte Moss trim tape ribbon using customer’s provided fabric. This trim comes in a few different color options! Contact us for colors!